Amendment Yes No May be denied Entry if already started working. You can but should NOT travel outside USA while your H1B COS application is pending. If your travel outside USA, USCIS will automatically abandon your Change of status request. I would suggest to avoid travel at all costs. APPROVED: You will have to get the hard copy of your approved H1B’s i797 and apply for H1B visa at US embassy before you can enter USA with H1B visa. DENIED:If the H1B COS is denied while you are travelling, you can enter USA only with any other visa you have. PENDING:You cannot enter using H1B status as the application is still pending. You need some other valid visa to enter USA. The underlying H1B application will be approved (if approved) with consular processing meaning that you will have to go to US embassy to get H1B stamped in your passport and then re-enter USA. You can travel outside USA during pending H1B extension. Make sure you have an existing H1B visa that is valid on the date of your re-entry to avoid trouble. If your current H1B visa has already expired and you travel, you will NOT be able to enter USA until your pending H1B extension is approved! Example: You can travel to India while H1B extension is in progress and visa is still valid for re-entry. APPROVED: You will have to get the hard copy of your approved H1B’s i797 and apply for H1B visa at US embassy before you can enter USA with NEWLY approved H1B extended petition. You can still enter using your OLD valid H1B (if any) but, your i94 will be restricted to old H1B’s expiry date. This will be a problem as you will have to either file another H1B extension to get new i94 or travel outside USA AGAIN and get extended H1B stamped in your passport. DENIED: If the H1B extension is denied while you are travelling, you can only re-enter USA if your existing H1B visa is still valid at the time of re-entry. PENDING:You can still enter using your OLD valid H1B (if any) but, your i94 will be restricted to old H1B’s expiry date. You can travel internationally while your H1B amendment is still under process at USCIS but we recommend to NOT travel as re-entry risk is very high. APPROVED:You will need to get the new physical i797 approval shipped to you to re-enter USA. DENIED:You can re-enter USA using existing H1B approval and stamp but will have to only work using the non-amended H1B. PENDING:You can re-enter USA using existing H1B approval and stamp but immigration officer will ask tough questions. You may be denied entry if you have already started working based on H1B amendment receipt. This is VERY HIGH risk situation. 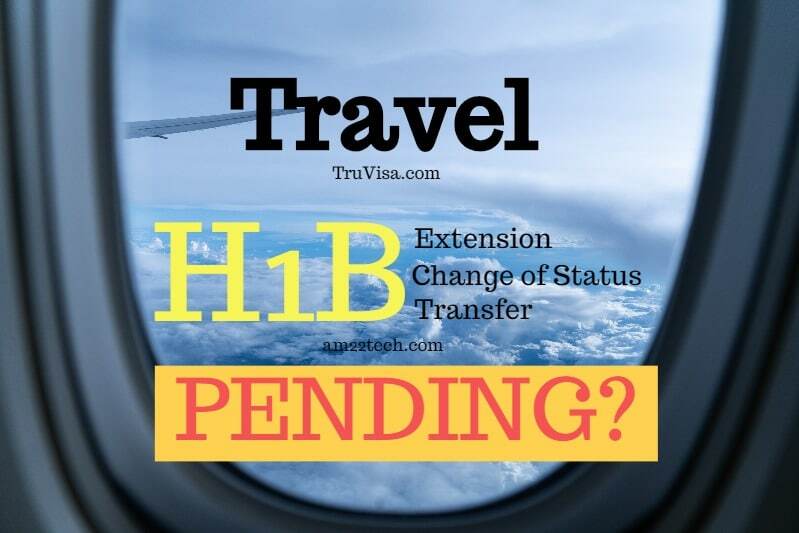 Can I travel while my H1B transfer is pending: Yes, you can. But, our suggestion is to avoid travel while H1B transfer is pending if you have already joined (started working) for new employer based on H1B receipt. If you are still working with current H1B employer and waiting for H1B transfer result, you CAN travel. Make sure your H1B stays valid at the time of your return to USA. APPROVED:If you had already joined the new employer before leaving USA, you are lucky. Get the H1B i797 hard copy mailed to you outside USA and then get H1B stamp using DS-160 in US Embassy. If you do not want to get H1B stamp, you can still enter USA using your old employer’s H1B stamp is its still valid. Show the approved H1B transfer i797 at the immigration counter at port of entry to get i94 with H1B transfer expiry date. If the immigration officer entertains your request your request, you are good. If not, your i94 will be restricted to old H1B’s expiry date. This will be a problem as you will have to either file another H1B transfer to get new i94 or travel outside USA AGAIN and get transferred H1B stamped in your passport. DENIED:If the H1B application is denied while you are travelling, you can only re-enter USA if your existing H1B visa is still valid at the time of re-entry. If you have moved on to new employer based on receipt, your old employer would have already withdrawn your H1B approval. You will NOT be able to enter USA if its already revoked. PENDING:High risk if you have already started working with new employer on receipt. Immigration officer may deny you entry as you do not have the approved H1B for your current new employer. We are seeing these days that not all updates are shown on USCIS site. Sometimes,t hey do and sometimes not. There is no other way to track status except USCIS site as far as I know. I work for MNC. I am currently on H1B stamped in my passport valid till 8/2020. I have I-797 and I-94 also valid till the same time. On January 17, my company filed for an amendment for just client change. On March 19, I have upgraded my petition to premium and my status still says case received and email notification sent. I have started working for the new client. I asked my immigration case manager to call and inquire. Today, my case manager informed me that I received a RFE. I am planning to travel this week to India. What are my options ? What is the risk ? Highly appreciate your prompt response. Please read the article above. It has covered your case for travel while amendment is pending. My H1b visa/I-94 is valid until June 30, 2919. I am about to apply for extension+amendment. Amendment is just for role change within the same Client and same Employer. I have my marriage coming up on May13 and I’m planning to leave to India on May 4 and return to USA by May 19th. 1. Is my travel in safe timeframe or should I postpone my wedding anytime after getting the approved H1b? 2. Will my extension be void if I apply for it and travel outside USA? 3. Currently my extension documents are pending for verification with my employer. Should I inform my employer to submit to USCIS after I return to USA post my marriage? Please read the risks of travel while Amendment is pending above. Taking the risk or not your individual decision. My suggestion is to file extension or amendment once you are back in USA. Okay thanks Anil for your response. I would like to clear few more things. 1. If I apply for extension + amendment now (before leaving from USA to India), is there any kind of such rule in USCIS that my extension+amendment process/petition will be considered as void if I travel out of USA? I mean should I need to apply for new one when I return back to USA? 2. If I don’t apply for extension + amendment now (before leaving from USA to India), then while returning back to USA I will have around only 40 days of valid stamped duration of visa (previous existing one). So will it be a problem during port of entry to have only very minimal number of days on the visa and also to not have applied for extension yet..? Will they consider not applying for extension as an issue? There is no such rule of making the extension + amendment VOID if you travel while it is pending. You can enter US with valid H1B visa with even a day left in your USA. I’m currently with employer A and h1 is valid till next year , I got an offer with employer b and they have applied my h1transfer and got the receipt number a month back in normal process.I would like to join employer B only after complete transfer approved. Now due to emergency I need to go to India next week ,will there be any issue due to this transfer pending ,though I’m with employer A ?and if Incase transfer approves when I’m India with employer b, still is it fine to enter with my current petition employer a as I’m planning to continue with employer A some more months after coming back?any other issues can you foresee in my case ? Apart from these ,if my transfer gets approved only after coming back to US , I’m still thinking to shift to employer b or not as I just got good hike and new role with my current employer A, so my query is even after my transfer gets approved ,can I continue with my current employer for the period I want ? Or once it gets approved I need to resign the current employer A and should start working with employer B? You can travel but your transfer may just be approved without a new i94. You can come back to US using existing H1B visa stamp. You can continue with your current employer even when transfer gets approved. No issues. You can join the new employer. I have few doubts about amendment and need your advice on below situation. my h1b extension was rejected in last August,so i travelled back to india and continued working for the same team from india. Then my company initiated visa under HNSC category for same client and location. This feb i upgraded to premium and I got rfe. I have time till may end to responde to rfe. My current project is getting over by April mid and new project will be with same client but different location. 1)will it be wise if i do amendment also along with rfe or wait for current visa to process and once it is approved, then apply for amendmnt. Your question about H1B Amendment for changed project has been added to our forum and answered there.